The erupting volcano outside the Mirage Hotel and Casino in Las Vegas, Nevada, USA. This stunning work of volcanic art at the Mirage Hotel and Casino along the Strip in Las Vegas cost $30 million to build (equal to the entire original construction cost for Caesars Palace next door). Please make sure to visit my full collection of Las Vegas pictures. 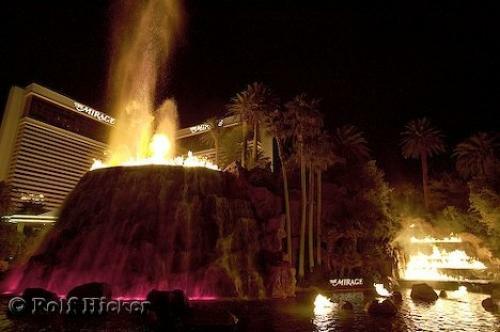 Photo of the volcano at the Mirage Hotel in Las Vegas erupting.